The 'service society' and the end of industrial work has been propagated for decades now. Today the press is stuffed with reports on the importance of the automobile industry for the national economy and with pictures of industrial workers. The articles and pictures scream out: 'This is supposed to be the end?! – Unbelievable!!'. But we all know that we not have reached 'the bottom of a crisis cycle' and that the car industry will not soon be back on boom track again – because all types of crisis congeal in the car itself: the economic downturn, the structural crisis, the product crisis, the over-capacity, the shortage of resources, the emission problem (carbon dioxide, particulate matter, benzene), the noise exposure, the lack of space (streets, parking space...), the looming collapse of the traffic flow and not at least the 'aging' of the core staff (for example the vast pension obligations of the US car companies). The product cycle of the car is overwound. The use value of the car itself is at stake. Since the end of the Second World War the automobile has fueled industrial development. It was a means of enforcing this contemporary form of capitalism we have today. In the last 40 years the annual production increased by 16 million to a total of 73 million automobiles (passenger cars, trucks etc.) worldwide. Two thirds of the global production takes place in Western Europe, in Japan and North America. In Eastern Europe, Russia, China, India and Brasil huge manufacturing capacities have emerged. Despite the propaganda of raising efficiency through Toyotism etc. the productivity development actually declined: while in the factory complexes of the 1960s production output was doubled within only a decade, it took another thirty years to double it again – despite the general growth of employment in the sector. During these last thirty years the old factories were dismembered and departments got outsourced, which makes it difficult to count the actual numbers of people employed. Many 'service companies' are now engaged in tasks which had previously been performed by the core production staff, such as machine maintenance or cleaning. Temp workers employed directly at the assembly line are also officially classified as part of the 'service sector'. In some ways we can count the automobile trade as part of production too, given that the four years of guarantee on new cars granted by the car dealers – on cars which actually are not fit for the market yet – have to be seen as an outsourced test phase for new models. Research and development agencies, software companies, management consulting agencies and engineering offices are also declared as being part of the 'service sector' – for example in Germany 20,000 external engineers are assigned the planning of certain parts of the production process or the development of entire model series. If we take suppliers and other up-stream industries into account and add the people employed in these 'service jobs' and the car dealership and repair workshops, we can see that in Germany there are 5.3 million people working in the automobile sector and in the EU at least twelve million. The number of companies which depend on the car industry is now also being revealed: the current production downturn in the industry has resulted in closures within the chip manufacturing, electronic and chemical industries. The huge automobile boom ended with the 'oil crisis' in 1973 and the ongoing struggles in the automobile factories which had started in the mid-1960s; for the first time the car itself was questioned as a product. In the 1970s the reaction to the struggles of the assembly line workers was the highly subsidised 'humanisation' of work by 'job enrichment', 'job enlargement' and 'assembly islands'. In the 1980s and 1990s this experiment was replaced by the 'Japanese Model': lean production, zero-flaw policy and just-in time turned cost-cutting into a dictum. The automation on the body and chassis work departments pushed the welders out of their central position. In the crisis in the early 1990s, when these strategies became widely implemented, concepts like 'team work' or 'decoupling of work and machine' were less terms of an 'attractive factory' than terms of a transformed work process aiming at flexible production. The first attempts by the planning departments to enforce these strategies in the core plants failed thanks to the rigidity of the workers. The workers knew that any restructuring meant an attack on their ability to control their own movements and performance. At that time these methods were enforced in the newly built factories in the former GDR (Opel Eisenach, VW Mosel and Daimler Ludwigsfelde); in the plants in the East of the EU; in the South of the US; and in Japan, where inexperienced workers accounted for a high share of the workforce. After these methods had been tested mainly in small teams – evaluating the maximum speed of the assembly line and of the work tasks which were not directly attached to the line – the 'assembly islands' disappeared in the mid-1990s. The work tasks were not re-integrated into the assembly line, but outsourced. This step became the precondition for the breaking-up of the core work force in the main plants: in a first move particular work steps and later on certain modules were outsourced from production followed by entire production departments. The outsourcing had various faces. At times certain work-steps were only formally outsourced, meaning that the actual work did not change; it was simply performed by workers of a different company. At times whole departments were marked off and separated by walls or fences. Often departments got relocated to places hundreds of kilometres away. Particularly in Germany – the vanguard of re-location strategies – these measures at first were rather uneconomic. The two main aims were firstly, to lower wages by mass redundancies in the core plants (newly hired workers get up to 50 percent lower wages and 'suppliers' pay even less. By re-locating formerly outsourced work the core work-force is now paid 'supplier wages'. And secondly, to break-up the huge workers' concentration of 30 to 50,000 workers employed on a factory premise and to reduce the unit sizes to manageable numbers in order to then set up competition between them. Logically the next step was the 'modulisation' : ideally a small number of suppliers provide modules, the bigger the better; these modules embody the more elaborate (manual) work steps and are delivered to the final assembly department, only requiring a few work steps to be attached to the car (e.g. the power train or whole front aprons). In this regard the automobile industry achieved leaps in productivity, but they got stuck in terms of reduction of numbers of these modules. In 2001 the industry imagined being able to reduce the number of modules to 10 by 2010, but actually a VW Golf VI still consists of 35 modules. All these outsourced production steps are generally classified as 'supplying industry'. Thus, tyre manufacturers are lumped together with new-style companies supplying ready-made cockpits or door systems or provide entire research and development tasks – and not forgetting to mention the complex software required to coordinate this kind of dispersed technical development and production. All these 'suppliers' have one thing in common: they are used as production buffers. Within the production chain they absorb the ups and downs of raw material prices and sales numbers. They have to guarantee a just in time production and delivery, but they are left with their products once the demand slackens. At the same time they finance the technical development. Many smaller companies – in many cases the suppliers of suppliers – operate with a low organic composition of capital: seats and complete modules are produced by intricate manual labour. These are often small-scale companies, but across a larger area thousands of workers, spatially separated from each other, and some applying rather traditional working methods, cooperate on the same product. In January and February 2009 the situation for many of these smaller suppliers making key products for various automobile manufacturers became aggravated. If the sole manufacturer for car door hinges supplying all car factories in Germany closes down, the entire automobile industry comes to a halt. In the plants of the big suppliers and even more so in those of the car manufacturers, the organic composition has risen considerably. Workforce has been cut and fragmented. These capital intensive plants have to churn out enormous quantities in order to run profitably – this is why the working-times have been extended. In order to be able to keep up the pace of a three-shift final assembly an enormous deployment of machinery in the paint-shop and body works is necessary. In a modern body works department the worker – robot relation is one to one. 1.The divisions within the workforce. All temp workers were sacked over the last few months, the temp contracts won't be extended, the core staff of smaller companies will not get compensated for working time cuts, in bigger companies the core staff is appeased with paid short-time work – and are demoralised with flexible working-time accounts. Some workers are on extra-shifts, others are assured or refused short-work time at shortest notice. 2. 'Including'. By re-insourcing some of the supplied parts the core workforce in the main plants are kept employed. The suppliers go bust, because the thin capitalisation does not allow production slumps. The first notice papers for the next round of layoffs have been signed. The heavy impact of the current crisis is about to smash through these buffers. After the 'breathing masses'  have left the factory, now the core staff will also be affected. Currently the car manufacturers are sacking people all over the globe. Nissan and PSA cut 20,000 jobs, GM wants to shed 37,000 jobs... This time it's not only the manual workers who feel the brunt. PSA and GM have already sacked 10,000 white collar workers each. Some car manufacturers won't survive this crisis (Chrysler is bankrupt, in the US they prepare for GM going bust. Opel, Fiat, BMW and Daimler are too small to survive etc.). At the least there will be a massive process of capital concentration entailing thousands of jobs being cut. Capital concentration and cooperation between companies is not a new thing: research and development tasks are outsourced to companies which offer services of production planning and engineering work to all car 'brands'. Companies cooperate even in the strategic sectors, such as engine construction (GM and Fiat have been pioneers in that regard). Some car multi sets up a new plant and another multi actually runs it – the cars are sold under their respective brand name. For a while now you can read Saab, Citroen or Volvo on the outside, while actually there is GM, Peugeot or Ford inside. The German car industry is still reluctant when it comes to such co-operations: VW, Daimler, BMW and Porsche still keep an over-priced 'premium segment', backed up by the state's 'official car' privilege. This specific business model is now going into crisis, similarly to what had happened to the 'white goods' of German companies like AEG: who would spend more money on 'German' goods if the washing machine is actually assembled in China? The relation between the wage of an automobile worker and the price of a new car has remained more or less the same since 1914 (the time of Ford's T-model): a car costs an annual wage. What has risen dramatically are the costs for maintenance and actual driving: insurances, taxes, fuel, parking fees and tickets, road toll. The state spends a major chunk of this tax income for the stimulation of car sales, either by actual acquisition of cars (police, army, fire brigades, ambulance, public institutions) or by subsidising (company cars, financial support for car journeys to and from work...). Less than half of the cars sold in Germany are bought by private consumers – and about 60 to 80 percent of these cars are bought on credit. But the cheap credits have only temporarily stabilised the car sales. The registration numbers of new cars have decreased by over nine percent between 2006 and 2007 and by twenty percent in 2008 – and in 2009 this slump will accelerate despite major state subsidies like the 'Abwrackprämie' . About 75 percent of the German car production gets exported, but abroad the demand for cars is collapsing even faster, particularly in those countries where companies pay relatively lower wages (e.g. in Poland). The low-cost strategy eats itself once fewer and fewer people are able to afford a car. This tendency will intensify once the mass redundancies in the car industry kick in. To be able to buy a car is one thing, to want to buy a car another. Is it still enticing to drive 250 h.p. to the sea or to the mountains for the weekend? People need their cars in order to get to work (most people commute a long way) – and at most times get stuck in traffic jams when they want to go on spontaneous short holidays. The promise of individual transport to reach one's destiny quickly, individually and comfortably has turned sour. For a century the automobile industry has propagated individual transport – railways and tram systems got wrecked. Towns were cut in half by huge concrete gashes and whole regions got fragmented; so people were forced to use a car. And there wasn't that much force needed! One used to be able to appreciate the value of one's own automobile. In 1914 a Ford T was all you needed in order to drive on the sand road to your family ranch; in the summer holidays of the 1970s the stuffed Fords of the Turkish 'guest workers' drove over the Autoput highway to the most remote parts of Anatolia. In the 1980s you couldn't imagine the disco nights without your own car. But what remains of the use value of the car today, what remains of its shine? Meanwhile the car manufacturers praise the change through alternative clean engines. The electric cars are supposed to pass as a new product. Though even here the cost-cutting strategy took its toll, there has hardly been any investment in research and development. A car today still consumes about two thirds of the amount of fuel a car needed a hundred years ago. Currently all companies present 'prototypes', but none of these cars is equipped with an engine that would exceed the technical level of a century ago (in around 1900 about fifty percent of all cars in New York were electrical cars!). Given that there are so many jobs in the engine manufacturing and steel sector attached to the combustion engine, there are no ideas in economic-political terms about what could replace it. Ecological half-knowledge becomes cutting edge in times of crisis. 'Less production means less pollution, the environmental and energy problems are very much sorted'. This thought underestimates the mighty giant of the global car industry – and at the same time it underestimates the lobby behind the electric car. Battery factories and (new) nuclear power plants instead of carbon emission and benzene? Wonderful new ecology! The work in the car industry in Germany is organised in such a way that the worst visible physical damage can be avoided and that fifty year old workers are still able to manage the work. Therefore ecological problems crop up rather indirectly in the product itself and its usage. The car is not only the most expensive and complex consumption good, it is a means of production, as well. It transports means of work such as the workforce. In a technical sense the car based transport system has reached its limit. Politically the needs produced by capital turn against capital itself. Both are related to each other, given that the needs – for example to drive 140 mph on a highway in a high-end car full of multi-media – are supposed to be satisfied on the journey to work 90 percent of all car journeys are work related. Unfortunately this is where you get trapped in a traffic jam together with the car engine blocks delivered by the truck in front of you. Thanks to just in time production the high ways' slow lane has turned into a mobile industrial storage space. Traffic jams cause billions of Euros damage to the national economy. On average every individual German spends fifty hours per year in a traffic jam. Traffic management and control systems are supposed to guarantee the traffic flow despite higher traffic density. More traffic control devices and tachographs are supposed to supervise people and their driving patterns. These devices are subverted constantly (radio warning against speed-controls, speeding, breaking traffic rules etc.). At constantly failing traffic lights people manage traffic themselves, at provisional major parking lots commuters organise car pools. These 'self-dynamics' become more interesting once we perceive the highway as an extended assembly line. Here the dubious attraction of car driving turns into a political element. The truck drivers' strikes in Spain and France in 2008 demonstrated how to stop production in the whole of Europe. Protesting automobile workers occupy the highway and thereby bring this 'assembly line' to a standstill. Traffic, noise and poisoning highlight only a small section of the contradiction between social production and ecology. The car reduces quality of life far more than it is able to promise freedom – and we have to spend days and nights producing this short-coming at the assembly lines, which makes it clear enough that we have to overcome this madness. Short-time work and enforced production breaks are able to give a small taste of what it would mean to do without smelly traffic jams, endless nightshifts and hospital visits of work-mates after their car accidents. The usage of the car as a means of mass transport has been irrational right from the start. The attraction of big engines and uneconomic vehicles is celebrated in all kind of ways, from rebellious films to Formula One car racing. With the introduction of electronically controlled cars and catalyst converters the related social games like 'car tuning' or 'garage pottering' become more difficult. Only few guys are still into this. Most guys get old cars and spend nights working on them instead of being well-rested for the early shift and hoping to be able to buy a new car. The capitalist society of the last century formed itself around the car. This society will also collapse around the car. Even in the 'car land' Germany everyone suddenly grasps that we are not at all at 'pole-position'. While the car manufacturers still think that they could use the effects of the crisis in an old-style way against the workers – in order to enforce all the re-structuring dreams of the last years in one go – some of them are already going down the drain. The core workforces of the main factories are not safe at all. The situation is open like never before. We use the terms 'module' or 'Modulisation' because they are commonly used. There is no systematic approach behind these terms; they only mean that single parts are assembled to a bigger unit. A 'module' refers to a complex component: a complete side panel, a power train (gear-box plus engine) or a lighting system. 'Big modules' are for example pre-assembled complex carcasses or roof-systems for convertibles. The term 'modulisation' conveys the manufacturers' propaganda claiming that a car could be assembled in 'Lego-style'. This might be valid for the final assembly, but car bodies still consist of more than 200 single parts. Referring to the concept of the 'breathing factory', a product of 1990s wishful corporate thinking, when management thought that they could produce (and hire and fire) on demand. 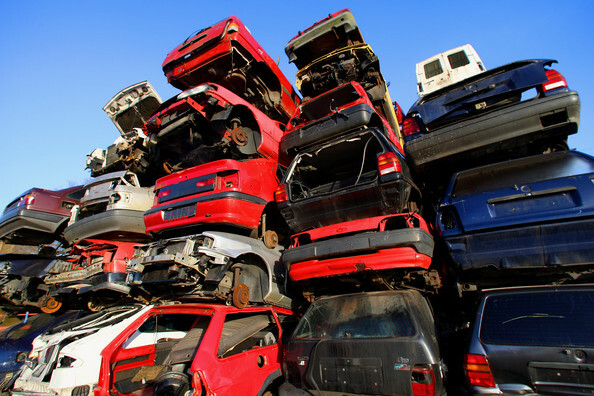 'Scrappage bonus': for allegedly 'ecological' reasons the state pays up to 2,500 Euro if you wreck your old car and buy a new one.